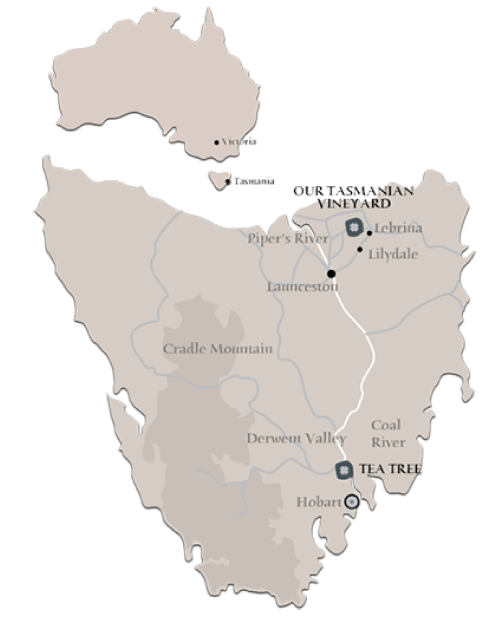 With the initial planting in 1986 of a sparkling Chardonnay clone (Penfolds clone), the Clover Hill Pipers River Vineyard, located on the outskirts of Lebrina Tasmania, was established. Today, 22 hectares of vines encapsulates the ridge line and surrounding slopes and is covered with rows comprised of Chardonnay, Pinot Noir and Pinot Meunier. Perched atop a valley with a clear view to Bass Straight, the vineyard enjoys cool climate maritime influences. Mild summers and long autumn days aided by coastal breezes create an ideal climate for ripening fruit full of flavours while retaining high natural acid levels. Fertile red composite rocky volcanic soils have allowed the dry grown vineyard to be established without irrigation whilst maintaining high vigorous vines. This vigour is controlled via high density plantings that are contoured to the slope of the hill. 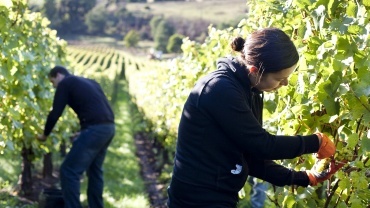 Focused on continual excellence in the vineyard which is required to produce premium sparkling products, Clover Hill began planting its Tea Tree Vineyard in the Coal River Valley in 2008. This site, with its northern exposure, low rainfall and dark clay soils, was an ideal location for a second vineyard to produce premium sparkling fruit that would add to the complexity and depth of the Clover Hill blends. On a gentle north-facing slope, a range of clones of traditional sparkling varietals were planted in dark cracking clay soils. Due to the wide spaced row plantings, the vines are able to maximise light interception and have greater airflow within the canopy. The familiar saying within the wine industry that great wines are made in the vineyard is an adage that is central to our beliefs at Clover Hill. This dedication to excellence has resulted in both sites winning the prestigious Tasmanian Vineyard of the Year Award – with the Clover Hill Pipers River Lebrina winning in 2005 and the Clover Hill Tea Tree site in 2016. FRUIT – Clover Hill is planted solely to the traditional sparkling wine varieties of Chardonnay, Pinot Noir and Pinot Meunier. These varieties are all trellised in traditional close proximity plantings. CLIMATE – A cool climate region with high seasonal rainfall and moderate maritime winds. SOIL – Red rocky volcanic soil (averaging 1-5m deep) is scattered with basalt stone. The soil is free draining with high organic matter and nutrient holding capacity. Varieties are planted in blocks along contours of soil depth and composition. GEOGRAPHY – The site capitalises on three natural assets – a constant maritime climate, rich volcanic soils and a sheltered amphitheatre. FRUIT – Planted in 2008, the first crop was harvested in 2011 and comprised solely of Chardonnay. Tea Tree is now planted with traditional sparkling varieties of Chardonnay, Pinot Noir and Pinot Meunier. Each of these varieties have been planted with a range of clones to further complexity. CLIMATE – Located in the center of a low elevation valley, the cool climate region has warm summer days with very cool nights – ideal for delicate cool climate fruit production. The low rainfall of the region and valley winds further aid the natural intensity of the fruit. SOIL – A predominate composition of red and black clay soils overlay a sandstone base. GEOGRAPHY – Despite its low altitude, valley winds and natural tree breaks, as well as a dam at the lowest aspect of the property, the site is relatively frost-free during the growth cycle. Vines are widely spaced, with 2.4m between rows and 1.8m between vines. Visit the Clover Hill Piper’s River vineyard, in the Tamar Valley Wine Route.